I rarely make travel plans during the summer. As much as I dread the heat, the rancid smell of city streets and dodging tourists, I like summer in New York City a lot. It is an expensive city to live in, with high rent, fare hikes, and cost of food inflation. Though, if you’re a savvy New Yorker, there are many freebies hidden treasure or cheap finds all over, especially during the summer months. My latest obsession is biking and it all began when I became a second hand -used Columbia bicycle owner where I bought on Craigslist.com last summer. When my former colleague had described “biking will change your life!” It certainly has. Summer is a lot more fun with a bicycle and you will see New York City in a whole new perspective. NYC Department of Transportation and Transportation Alternatives collaborate annually and for the 4th year organized NYC Summer Streets. From 7am – 1pm for three consecutive Saturday weekends (Aug 6, Aug 13 and Aug 20) the streets along Lafeyette from downtown Brooklyn Bridge / City Hall to Upper East Side 72nd Street and Park Ave are closed off to cars driving and parking; where joggers, strollers, pedestrians and bikers rule the streets! This year with food sponsors like: Wholefoods, Chipotle, illy espresso, Stonyfield Farm and Brooklyn Salsa Company. The highlight of Summer Streets is the midpoint of the route. 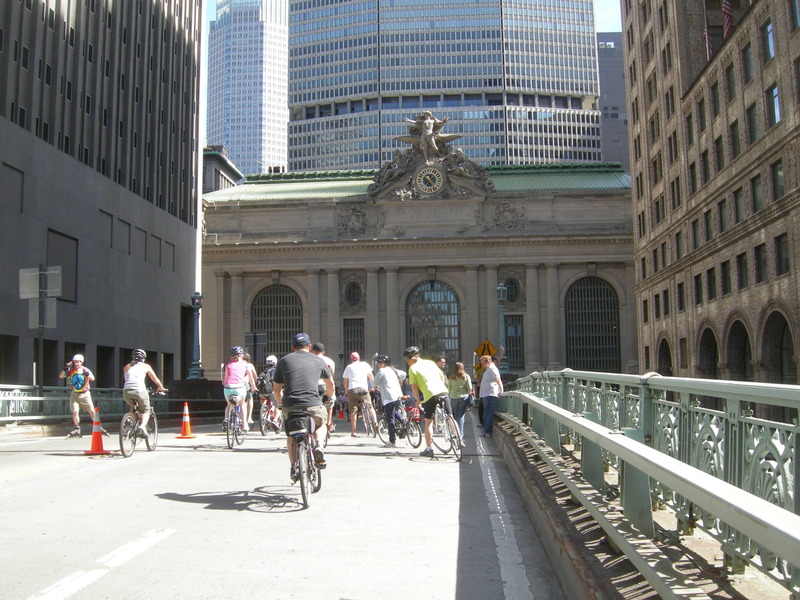 Whether biking, walking or jogging through the closed ramps normally driven through by yellow taxi cabs is the Grand Central Terminal. There are many exquisite and breathtaking architecture in New York City and Grand Central Terminal is one of few that remains. I recently visited the latest or the trendiest outdoor street food market across in Williamsburg, Brooklyn is the Smorgasburg. I went to visit to see what all the hype was and the result was an over indulgent and guilty but not pleasurable biscuit fried chicken sandwich with ranch dressing from Kings Crumb. Very hospitable and friendly service but I’m concern this dish will need to be accompany with a Pepto Bismol. And not to pigeon hole Kings Crumb, many dishes I was able to observed may need a Tums beforehand. A lot of food trending was sliders, tacos, grassfed beef hot dogs, lobster rolls, and fried food, well, it’s American street food, except here is in moderation unlike what we see on Man vs. Food. 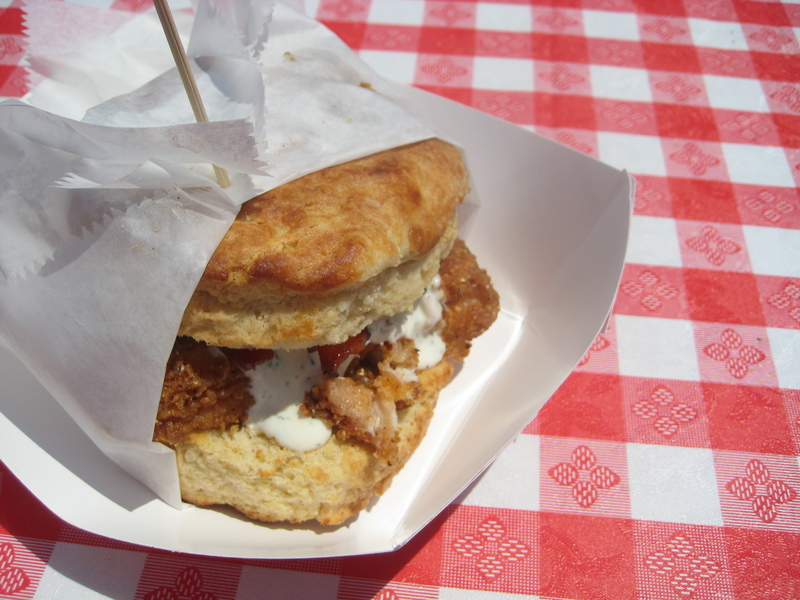 I recommend to share the biscuit, fried chicken sandwich and many other food with a friend but my greedy self ate it all in one sitting on the curb of a street sidewalk. Smorgasburg or Williamsburg is a place to check out. It’s not completely hipster-fy but many interesting and creative business are booming. Walk down on Bedford Ave., Berry Street or on North 3rd, and a few of my favorite shops where I can spend hour(s) at are: The Brooklyn Art Library, Blue Bottle Coffee, Mast Brothers Chocolate, Sprout Home and Bedford Cheese Shop. In many ways, Williamsburg is one of many parts of Brooklyn already gentrified but the feeling is still very industrial and creative. It’s definitely worth a visit and it was not until last fall after living in New York City for my entire life that I had first walked across the Williamsburg Bridge and ever since it’s been one of my favorite bridge to take a stroll across, well second to Brooklyn Bridge. One of many things I love other than eating, yes I have hobbies other than eating, is taking long distance walk and Williamsburg Bridge is safely divided from pedestrians and bicyclers, though what’s beautiful about Williamsburg Bridge is towards the center it merges, which is very unusual. I have yet to ride by bicycle across the Williamsburg Bridge and it’s on my list of things to do before the Winter chills return. Any takers on riding across the Billyburg Bridge for a burger at the Williamsburger? For those who do not own a bicycle, take a free ferry ride for the free bicycle rentals on Friday at Governor’s Island. The ferry departs from Lower Manhattan from the Battery Maritime Building. To make your trip even more fulfilling, pack a banh mi sandwich from Chinatown for lunch. Enjoy the remaining dog days of summer eating and biking. Walking in New York City today seem unusually quiet for a 4th of July. I assume many have travel out of the city for the long weekend but for those of us who are dirt poor like myself, a short ferry ride to Governors Island is a perfect oasis from the metropolis. Being Fridays at Governors Island are Free Bike rentals Fridays for the second year, Cynthia and I took advantage of this free city perk. I think we can all agree for those who can ride a two wheeler that riding a bicycle is absolutely liberating though ride a bicycle in Manhattan can be intimidating fighting the pedestrians and traffic which is why Governors Island a car free island is awesome! The free bike rentals are for 1 hour and it is a great way to explore the island, a once military base home to US Army and Coast Guards and it has beautiful views of Lower Manhattan to the Statue of Liberty to Red Hook, Brooklyn. Governors Island is also now home to one of my favorite street vendors Veronica’s Kitchen, a Jamaican food vendor. On weekdays you can find Veronica’s Kitchen parked on the corner of Wall Street and Front Street which I used to be a regular while working at Starbucks Coffee. Since 2007, Veronica’s Kitchen have been a finalist in the 2007 Vendy Awards and deservingly to be recognize. Veronica Julien treats all her customers with care and love. 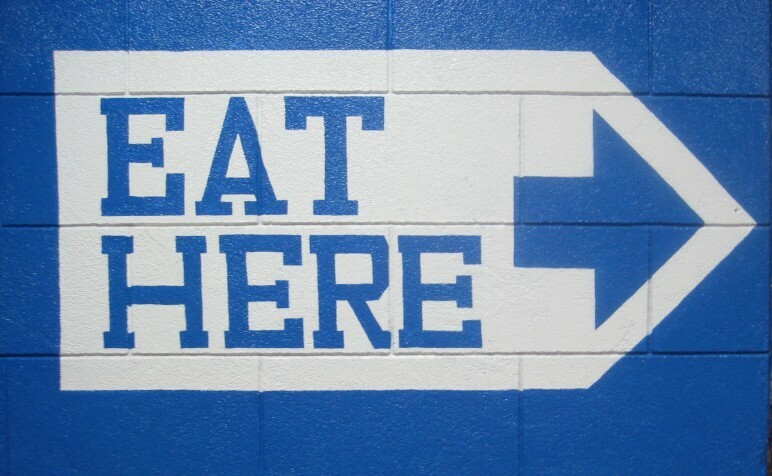 Providing generous portions for a small ($6.50) a choice of 2 sides and a protein meat. Being on Governors Island I had to make a visit to Veronica’s Kitchen so I chose my usual: Curry Chicken, with rice and peas and their string beans always run out so collard green. For Cynthia I had recommended their Jerk Chicken, with rice and peas and she liked fried plantains and added her signature sauce: thousand island dressing w. ketchup. As I recall it the curry chicken is slow-cooked till the chicken is tender and the curry flavor absorbed into the chicken, absolutely delicious. On the other hand Cynthia’s Jerk Chicken which is what Veronica’s Kitchen is famous for went wrong…it was way too spicy for either one of us to handle it, burning lips to perhaps even swollen lips if any of us were to finish eating it, next time we’ll go for the safer option and try the goat stew. Or I read from New York Magazine Grub Street new food vendors such as Harry Hawk’s bacon wrapped hot dog will be introduced to the island this summer…sounds like a brilliant heart attack. Later we made a visit to Museum of Modern Art (MoMA) Free Fridays 4-8pm – Love it! I have failed 2 attempts in visiting MoMA in the last 6 months due to the outrageous lines wrapped around the museum block by European tourists but thankfully found the line shorter or somehow manage to cut through the line without getting caught. Saw the Song Dong show that has been getting reviews even by Sinovision, a Chinese prime time news coverage for Time Warner Cable viewers. The installation of collection of items reflects the many habits of Chinese people and my conclusion from this exhibition is my mother is an artist too. Refused to go home at 8pm, Cynthia and I trekked our way to Park Slope, Brooklyn to satisfy our sweet tooth at The Chocolate Room. The first step into the shop was a delectable glass case filled with ornate chocolate and the smell of what I imagine Willy Wonka and the Chocolate Factory would smell of. The waitress brought us two glass of water with an unexpected sample starter of a chocolate sorbet instantly, I knew I was at the right place. I wanted to try all the desserts on the menu but Cynthia and I compromised on sharing a chocolate fondue and she had ordered a pot of chocolate hazelnut tea -chocolate everything here and I was crazy to order a cafe torino expresso with chocolate and milk. Along with the chocolate fondue was slice of pineapples, strawberries, bananas, homemade marshmallows, and scrumptious pound cake. The chocolate fondue is perfectly sweeten and nicely thicken for dipping though the depth of chocolate was not enough for the fruits and cakes, and marshmallow to be fully covered. Nonetheless, we cleaned the chocolate fondue real good. Cynthia’s chocolate hazelnut tea had a nice aroma and the tea was chocolate in color too and my cafe torino was a bitter dark sweeten chocolate espresso, a match made in heaven for the coffee + chocolate lovers. A great place to end the day and a four day work week, wishing every week was a four day work week…damn.